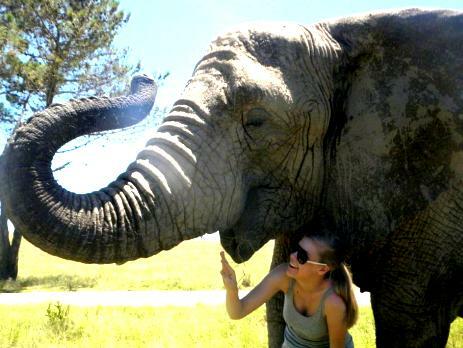 Oyster volunteers in South Africa help to complete daily research on elephants close to the stunning Garden Route. This can involve seeing how they interact with each other, how they react to human presence, where they graze, what they eat and what might cause stress. The research on elephants is fascinating, as whilst you are collecting the data, you have the unrivalled opportunity to really get to know these gentle giants. Many Oyster volunteers find it daunting to think that they will be starting to do the research on elephants straight away. Don’t they all look the same?! How can we tell them apart? Interestingly, elephants have their own personalities which instantly shine through, and it is amazing how quickly volunteers learn to identify the elephants. This can be thanks to specific markings on the elephants, or the characteristics of their personalities. We have popped together a quick guide to help upcoming volunteers identify the elephants before they even arrive. Please note, the elephants at the park may well change by the time that you arrive. 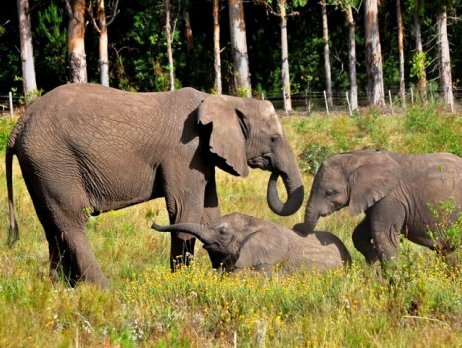 Some elephants only stay for a short while to complete their rehabilitation, whereas others will be long-term residents. Sally was born in 1989 and is the largest female elephant at the park. She is also the oldest elephant at the park. Sally was born with only one tusk, which makes her easily identifiable. As the matriarch, Sally is the boss, and the other elephants will follow her lead. 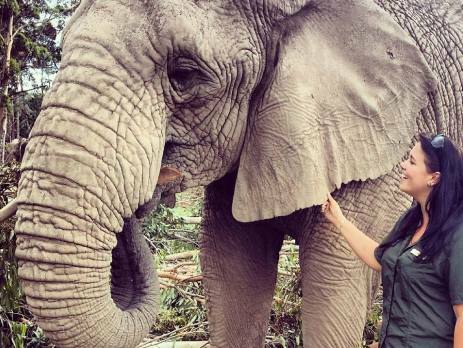 She is a gentle elephant, but she does throw her toys out of the pram if she thinks that other elephants are being treated better than her – such as if they are fed first! 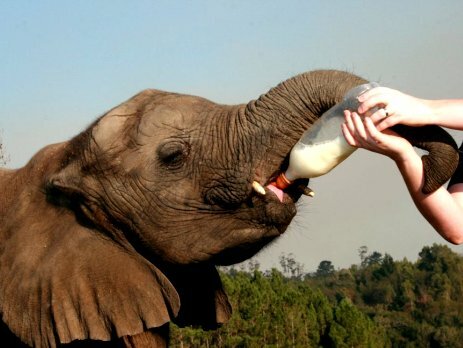 Sally was saved from culling in the Kruger National Park in 1994. Nandi arrived at the park in 2002 and is the first mother elephant at the park, giving birth to her daughter Thandi in October 2003. 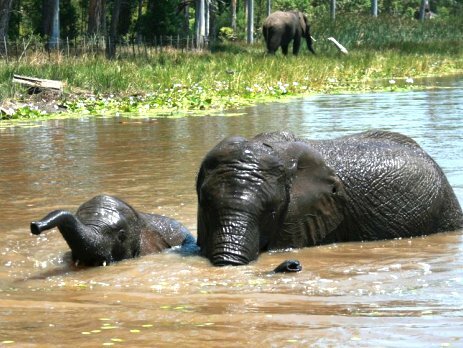 Elephants have the longest gestation period of all mammals, lasting just shy of two years. Nandi was born in 1993 and has a large tennis ball sized hole on the edge of her left ear, making her easily identifiable. Despite the challenge of having to learn to be a mother without the guidance of other mother elephants, Nandi has done an excellent job with little Thandi. Nandi and Thandi are rarely separate from each other. If there is ever any conflict or tension between the herd, Nandi will rush to Thandi and they will wrap their trunks together to assure comfort and to make sure her daughter is ok.
Thandi was born in October 2003, and has really developed a personality since then! She is now a bit of a show-off and can be rather bossy. She loves her mother though, and would never dream of bossing her around. Thandi has hilariously large ears, making her look rather like Dumbo! Keisha was born in December 2003, and arrived not long afterwards at the park. Her mother died when she was very young, leaving Keisha to fend for herself. She is very easy to spot due to the holes in her ears, caused by other elephants pushing her away when she tried to suckle from them. With a lot of care and attention from the experts at the park, she was able to make a full recovery. She is now a happy little elephant, although a lot more quiet and shy than some of the others. Keisha means “Favourite” in Swahili, and her fighting spirit has certainly meant that she has become very popular amongst staff and volunteers alike. 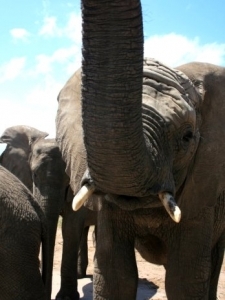 Thato is the youngest elephant of the herd, born in 2008. She arrived not long after her birth after her parents were killed on a hunting farm. She is identifiable by her small tusks and her short stubby tail. She is very close to Keisha, and the two can often be seen playing together. Amari arrived at the park in 2017 with Shanti and Madiwa. It is thought that she was born in the year 2000. She is a quiet and gentle elephant, often keeping to herself. She is a quiet leader however, and keeps a careful eye on her two close companions Shanti and Madiwa. She has relatively long tusks that point outwards. Shanti arrived in 2017 from the same reserve as Amari, and at the same time as Amari and Madiwa. She is thought to be born in 2002. She is quite rebellious, and will only do what she wants to do – she is often taking charge and doing her own thing. She also likes the treats, and will often gobble more than her fair share of food! She has very long tusks that point downwards, a very short tail and a piece of her right ear is missing. Madiwa arrived at the park with Amari and Shanti. She originates from the same hunting farm as Thato and Mashudu, but is slightly older than them. It is estimated that she was born in 2005. Madiwa is the bravest of the three elephants, and always leads the way in trying new things. She loves spending time with Mashudu and Shungu, as well as Amari and Shanti. “Madiwa” means “darling” in Shona, which is very apt as she is rather adorable! She has big Dumbo ears and long curved tusks. In 2013, Oyster “adopted” Mashudu the elephant, and he has become our firm favourite ever since. He was born in 2007, so is very young and playful. He comes from the same hunting farm as Thato, and his mother was also killed by hunters. He arrived at the park in 2008, on the same day as Thato. He is full of energy and is often the life and soul of the party. He is really close to Shungu, and they can often be seen playing together in the field. He is becoming a bit of a lady’s man, and is certainly the cheekiest of the herd. His name means “lucky” in Venda, and he certainly was lucky to be rescued from the hunting farm and brought to the park. Shungu was born at the park on New Year’s Day 2007. He is very naughty and playful, and has a great sense of humour. Amusingly, he can often be seen chasing the zebra in the park, trumpeting loudly at them. To find out more about the research on elephants that you can do as a volunteer, check out our volunteer with elephants webpage. Next Post What&#8217;s been going on with our shark volunteer project in South Africa?